Celebrating 40 years of original design, innovation and quality, leading luxury bathroom and kitchen specialist Waterworks is known for its craftsmanship and expertise, gained from a rich heritage in the plumbing and bathrooms trade. Inspired by her father’s business, which since 1925 had provided the most mechanically advanced plumbing fixtures and fittings on the market, Barbara Sallick, along with her husband Robert, founded Waterworks in 1978. The company’s aim was to bring visual appeal to bathroom products while still placing importance on performance. 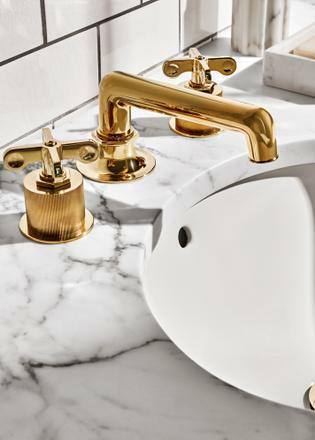 At a time when bathrooms were a purely functional area of the home, somewhat overlooked in design, the couple set about creating fixtures and fittings that made the room feel like a luxurious space in which to spend time. In 1993 their son Peter joined the company as CEO, and with his direction Waterworks has become a full-service industry leader in bathroom and kitchen design. Waterworks’ driving passion is to inspire its customers with unique, original designs that are engineered to endure. It combines the highest quality materials with the latest technology and time-honoured manufacturing techniques to produce items that are both beautiful and built to last. Its reputation for quality has seen the company collaborate with world-renowned designers and architects on some of the most exclusive projects across the globe, from superyachts to private residences to luxury hotels, including groups such as St Regis, Four Seasons, Mandarin Oriental and Kimpton, as well as boutique hotels Auberge du Soleil, Soho House and Jumby Bay. The assortment of products is both rich enough for personal interpretation and curated enough for cohesiveness: schemes can be created that are unique and feel entirely bespoke. Designs range from traditional to modern to innovative, all incorporated through Waterworks’ distinctive lens. 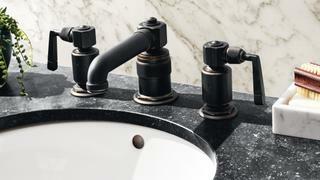 Two recently launched bathroom collections include Regulator, a play on the industrial boiler rooms of the early 20th century with emphasis on substantial plumbing components, and Dash, which pays homage to design elements of the 1930s with pared down shapes, softened curves and minimal detailing. All fittings are available in a wide range of metal finishes, from unlacquered brass and burnished nickel to striking antique copper and matt gold. Surfaces, lighting, hardware and accessories are designed to complement fittings and fixtures. When it comes to its stone surfaces, Waterworks selects the stone by hand, ensuring quality of colour, variation, activity, texture and strength. Its signature Architectonics ceramic tile is handmade and offered in 120 colours. A number of Waterworks’ products are specifically suited to superyachts, not least for their nautical references. The Signal light takes its inspiration from the refracted glow of a lighthouse, and the Pomona cabinet pulls were inspired by the hardware on a boat, such as mooring eyes and deck hinges. The Sterling latch, designed to be sleek and sit flush, also works well on board. The company offers the option for customisation of its products, including adding unique metal finishes, design modifications and mechanical adaptations. Thanks to the company’s manufacturing experience and its talented team, many requests can be accommodated. As well as providing products for bathrooms, Waterworks also supplies for kitchens, offering the complete range, including fittings, surfaces, custom cabinetry, lighting and hardware. The company is known for exemplary customer service, from the beginning of a project to years after the installation is complete. So for a world-class design experience combined with technical expertise and unparalleled service, look to Waterworks.